Hey everyone! 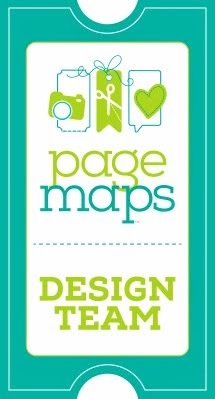 I have a new layout to share with you today. 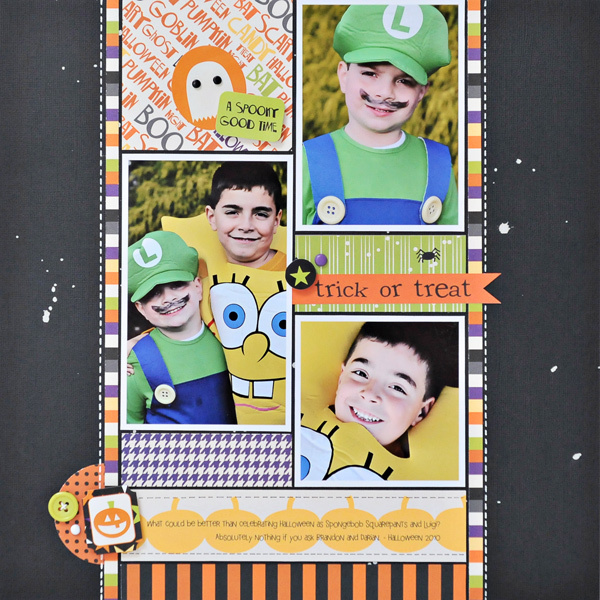 This layout uses the adorable new Spooky & Kooky Halloween line by Bazzill Basics. Yep, that's right, Bazzill Basics makes patterned paper now too! Pretty cool huh? These are photos of my two boys last year on Halloween. 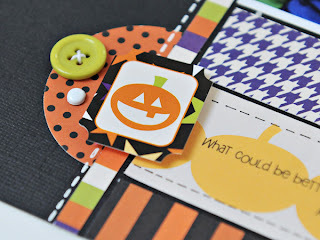 I love that this collection has some yellow in it along with the more traditional Halloween colors of orange, black, purple and green. It really helped to tie in the colors of Darian's yellow Spongebob costume. I grounded my design on black cardstock that I splattered with some White Calico Mister Huey spray mist by Studio Calico. I then created a simple grid design which allowed me to use several different patterned papers from this line without overwhelming my photos. The Spooky & Kooky line also includes coordinating stickers and buttons. I popped up one of the stickers with dimensional adhesive and clustered it with a button and brad to add a bit of detail to my journaling strip. Adorable LO! One of my girls will be a "pirate girl", another will be an elegant witch-the other two, don't know yet! I had no clue they had patterned paper now.. Cool! Love the layout! Another cute Layout. My boys plan on being the Hulk and a Skeleton this year. What about your boys? My kids are going to be a bear and a black cat this year! No kids left at home, but I was just invited to a party. I better start thinking of something to wear! Great layout. My grandchildren are going as a ladybug, bee and country rock star! Since my daughter is grown, I'll tell you the favorite outfit I had when she was little. I made her a Tinkerbell costume, and made myself a Peter Pan costume! That was a lot of fun. She was in preschool at the time. Love your layout. I don't have any kids to dress up. Thanks for the chance to win! I don't have kids yet, but my nephew said he wanted to go as Mario! I was thinking of dressing up as ketchup or a sock monkey! Great layout! Thanks for the opportunity! My 3 1/2 year old son is going to be a Police Man. We already have the costume! 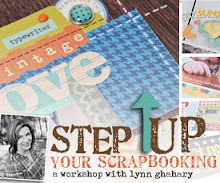 As a new scrapbooker, I like seeing lay out ideas ! My new grand daughter (the reason I started scrapbooking) will be dressing as a pumpkin! Halloween is one of my favorite to crop. My son is going to be a Flying Monkey of OZ. It is so cute. These are my grandkids and they are still tossing around what they want to dress up as. One is pretty sure he wants to be a transformer form Dark of the Moon. You got me. as Iam out of the loop. The others may be gangsters. Hope that is just a phase LOL. Thanks for a chance to win. I scrapbook these grandkids. my kiddo cant decide......lol. at the moment its everything from darth vader to steven tyler????? So far I have a Buzz Lightyear, a butterfly, an orange(yes... an orange!) and a scary grim reaper guy. Quite the variety if you ask me! Love your work! My Granddaughter wants to be Jesse from Toy Story! My baby is 23, but she plans on dressing up as a pirate. My kids are 27 and 23! The 27 year old is going to be a peacock complete with tut and feathers! That is if I get the tutu finished! I don't have any children but my nephew is going as Woody from Toy Story! His all time favorite character. My daughter wants to be a zombie :((( I am hoping to change her mind!! Well, my children are all grown up, but I do have one daughter whose husband's office usually dress up. Last year my daughter dressed up as the Cat in the Hat. She made t-shirts with a number on the front representing the Thing in the Cat in the Hat for each of the staff members, and each staff member wore a wig. She and the staff had their picture put into a locale paper. No telling what she will come up with this year. Great layout! Love that line! Believe it or not my 4 year old son is going to be a sack of potatoes!! He got the idea from a Richard Scary book! My mom and I made the costume including potatoes out of panthose! He is definitely a creative boy! And I will be a chef, ready to cook up my potatoes!! My Granddaughter said she was going to dress like a Princess for Halloween! Thanks for the opportunity to win! I do not have children but my dog, Leila likes to dress up. She is going to be a giant bumble bee! 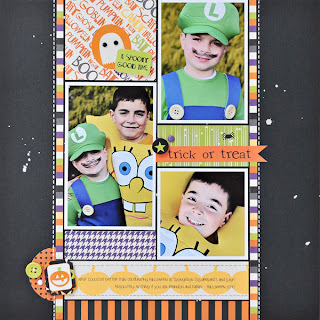 This would be so perfect to use for my 9 year olds Hallowe'en page! 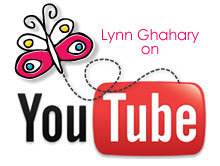 LOVE your ideas!! I have a hill billy and dorothy from the wizard of oz! So cute! My oldest and two friends are dressing up as the "Three Musketeers" and my youngest is going as a creepy rag doll! 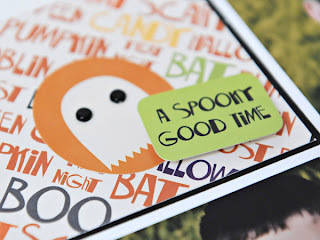 I love this Halloween line! We will have aCinderella, an Ironman, a Sally from Nightmare Before Christmas and 2 others still undecided! Thanks for the chance to win! My daughter is going to be a kitty cat this year. I'll have a peacock and a zombie ninja this year. Love your layouts. Thanks for the chance to win this fabulous collection! My boys are 5 & 6 and are all about their Nintendo DS! SO... I have Mario and Luigi this year! What a great layout! Love the PacMan ghost! A Jack'O'Lantern. She will look so sweet and cuddly in her round little costume. I do not have any kids but my boyfriend and I are going as ice cream cones!! Love your layout, and it's nice to see a Halloween page that's not overly dark! I am making a Pokemon costume (good luck to me) so my seven year old can be Pikachu! Cute layout! Oh, I think her costume will be American Idol related. She is still deciding, wink! So adorable, love it! I don't have kids, but I'll tell you what my husband and I plan on dressing up as this year. We bought a suit coat and tie that matches a dress from a thrift store. The key is they are this ugly teal. So we're gonna wear it like it went out of style this Halloween. My son will dress up like a ninja warrior this Halloween. Love your LO! So fun!! Thanks for the chance to win! My daughter is going to be a hippie and my son is past the days of dressing up. :( Thanks for the chance. Love your layout! My niece is dressing up as Cinderella and my nephew is going to be a Star Wars Storm Trooper. Thanks for the chance to win! congrats to you on such a cute layout. My one son Andrew, will be a mental silver skeleton, my son Jesus will be a pirate, I will be a polka dot baseball,and my 9 month old grandson will be a giant pumpkin. Adorable layout. My boy is going to be a shark. Can't wait!